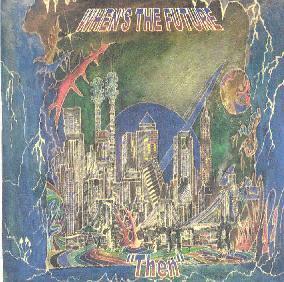 When's The Future - "Then"
When's The Future is a new project from some of the folks from Krom Lek. They released an excellent 4-song teaser a few months ago (see AI #24) and Then is their debut full length. Like Krom Lek, When's The Future draws heavily on British festie psychedelia, space rock and Gong, but there's also lots of electronics and I also hear bits that reminds me of their Stone Premonitions label mates Census Of Hallucinations. The album opens with "Land Of Milk And Money", a rousing psychedelic funk song with elements of Krom Lek and Gong. "Cop Out Dood" is similar, and includes some ripping space guitar. "Tribal Pot" is tribal indeed... tribal percussion, chants, flutes and droooooning didgeridoo all come together for that big musical mantra in the sky. "My Coat" is a beautiful song, being a gorgeous blend of folk, progressive and psychedelic elements. A great mixture of acoustic and cosmic ingredients. The Indian influences really come to the forefront on "Go East ‘N' Feast". Ya gotta love that blend of sitar, tablas and bubbling electronics. "Psilocybe Astral Glide" is the brain searing space rocker of the set. The last couple minutes of the song transition to a floating electronic journey. But on the rocking parts the band is tight as a knot. Totally tripped out and very much like Krom Lek. "It All Goes Back To The Sea" is less purely rockin but equally potent, with its Dub-ilicious beats, meditative electronic passages, cosmic funk and tripped out Gong styled space rock. There are also several instrumental tracks that are more purely electronic. "Rizziamorph Utopia" consists of spaced out electronics, pulsating DJ bits and other alien embellishments, and nice rolling cosmic groove. "Dream Cracker" is similar, with heart pounding Dub beats, Indian stylings and loads of freaky voice samples. Very nicely mixed. You'll pick up all kinds of fun and strange sounds under the headphones. "Emotion Explosion" is a fun spaced out electro tune that reminds me of Quarkspace and Church of Hed. And among the electronic songs "My Giddy Aunt" is probably my favorite. It's also on the Now CDEP, and I'll just repeat my comments from that review that it consists of cosmic space electronics that blend Tangerine Dream and Hawkwind, and I'm reminded of moments from Electric Teepee and the live Love In Space. In summary, this is quite a stunner that covers a variety of space rock, psychedelic and space electronic territory. Most of the songs transition smoothly from one to the next, making this very much a full album experience. Lots to please space rock fans of many stripes, and it's an absolute must for Krom Lek fans. For more information you can visit the Stoner Premonitions web site at: http://aural-innovations.com/stonepremonitions. Email at: info@archhouse9.fsnet.co.uk. Contact via snail mail c/o Stone Premonitions; Arch House; Front Street; Alston; Cumbria; CA9 3QW; UK.